We had a jam-packed weekend full of fall fun. The weather cooled off Friday throughout the day, and we've had evenings in the low 40s and highs only in the 70s...what a treat! I had a ball hosting my Bunco group Friday evening. We always have such a good time. I made Creamy Chicken Chili, which was a HUGE hit! It is loads of creamy goodness--great comfort food. I have made it once before in the crockpot, which was fabulous. Whoever invented that thing was brilliant! Unfortunately, I wasn't home long enough Friday to throw everything in the crockpot, but I'm happy to report, you can make it on the stovetop, and it turns out great too! Saturday was full of soccer, a fall fest and a Halloween party at a dear friend's house. Sunday evening was Trunk or Treat at church. Our "trunk" showed It's The Great Pumpkin, Charlie Brown, and gave out loads of candy...fun times. :) Cora has wanted to dress up as Super Why! from the PBS show for months now. I was excited because I knew I could make the costume easily. Well, when her best buddy heard that news, he no longer wanted to be a fireman or Spiderman. He had to be Super Why! too. I told his mama, "Never fear! Super Mom is here! I will make him a costume too!" 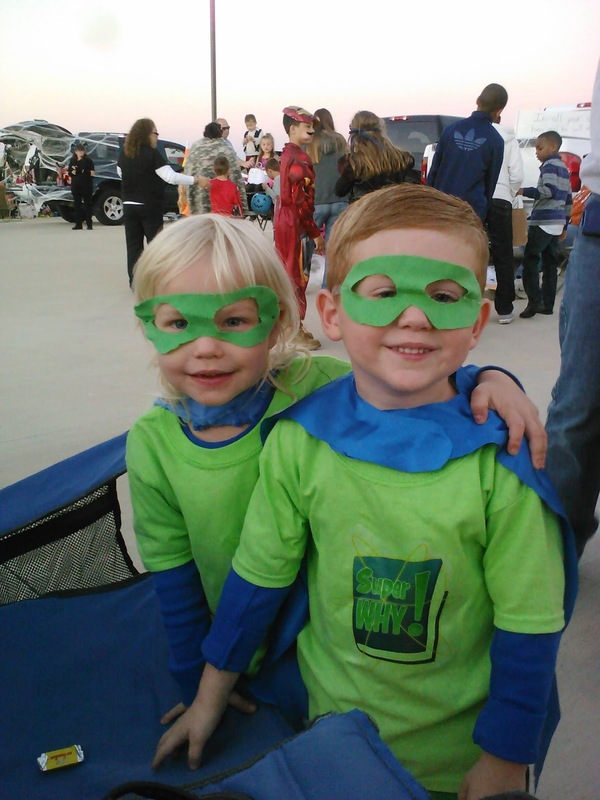 I didn't really say that, but I did tell her I would be happy to cut him out a mask and cape and iron on a Super Why! logo to a green t-shirt just like I did for our little super hero! Here they are at the church. It is so hard getting them to stay still for a photo. So glad I got this one. 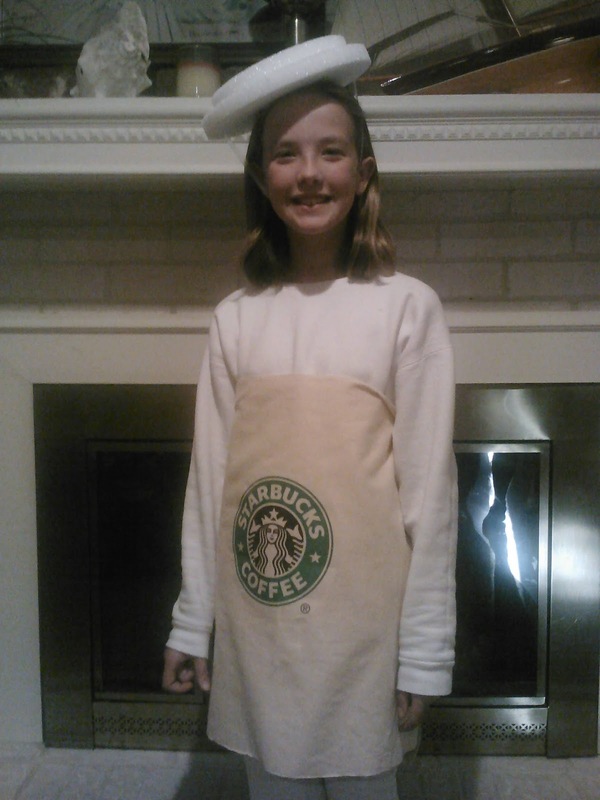 Carleigh is dressing up as a cup of Starbucks coffee this year. She has dance class on Wednesdays, and the teacher said they could wear their costumes as long as they could dance in them. So, off to Pinterest I went in search of a costume for her. I found a picture of an adorable girl wearing a Starbucks coffee cup sleeve and lid and thought that would be PERFECT for our girl. When I mentioned the idea to Carleigh, she thought it was pretty great too, so I checked off the box for her costume. A little felt, an iron on Starbucks logo, and some styrofoam, and she was good to go. Luke is into monsters and creatures. 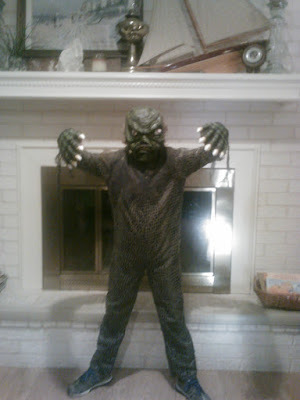 He wanted to watch The Creature from the Black Lagoon the other day. He was pretty disappointed by how cheesy it was. I was surprised myself. But, he did like the whole concept, so I was thrilled when I found the costume at Target the other day. We're looking forward to more fun this week. Hayride trick or treating...what could be better!? Hope you have a great time this week. Have you heard The Pumpkin Patch Parable? I love the little book by Liz Curtis Higgs. I've shared about it here. Enjoy your day. Please don't forget to say a prayer for those facing the storm on the east coast.